The dark red cotinus coggyria ‘Grace’ is a focal point in the garden. As you enter from the delightfully named Ticklebelly Alley, you see my favourite view of the garden. The dark red tree is a cotinus coggyria (probably ‘Grace’). It’s the focal point for my colour schemes in summer and autumn, as it turns a glorious red-gold. It looks magnificent with burgundy and orange dahlias, and with brighter reds in summer. There is also a mature silver birch and a yellow-leafed robinia frisia. 2) Sometimes a bargain isn’t as cheap as it seems…. We bought the wrought-iron chairs from a depot vente in France for £20 each. Strapping them to the roof of the car and driving them back to England was a nightmare! And heaven knows how much it cost in extra petrol. The table is an old sewing machine base, which my mother bought from a junk shop in the 1970s. 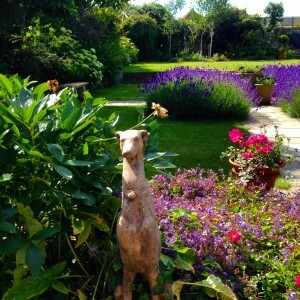 And the two cast-concrete greyhounds came from Warehams in Whitstable – a lovely vintage shop with lots of garden stuff. Step up to what we grandly call ‘the parterre’. When we bought the house, the garden sloped gently down to the terrace. However we decided to make it more formal, and create a ‘four-square’ parterre to echo the ‘four-rooms-on-four) architecture of the house. And because British summers can be so variable, I wanted a big bed right in front of the kitchen window so that we could see the best of the flowering all year round. We found the wonderful AS Landscapes in Faversham, who did the work in two weeks, including building the retaining walls, laying the paths and creating raised vegetable beds. The pots are mainly seconds from Hode Pottery – which I have collected over the years. The zinc planters in the corners are ‘dolly tubs’ or old laundry tubs. I bought them off Ebay a few years ago, although they have now become quite fashionable so they are more expensive. The parterre two years ago when the lavender was planted. The pots at the centre are from Hode Pottery. 4) A simple lawn with straight edges takes 50% less time to mow…. Mr Middle-Size is the ideal gardening Other Half, because he is so obliging about the tiresome jobs, like mowing the lawn and taking stuff to the tip. And he is very appreciative of the final effect. But he does not enjoy gardening, and wanted a lawn that was quick to mow. So the back lawn is now open and rectangular. and bordered with beds. It takes 40 minutes to mow the lot. When it had beds and fruit trees in it, it took one and a half hours. The back beds are coming along, but it has taken me time to find my feet with them. Our predecessors were fantastic gardeners and had lovely shrubs. But most were very mature. My lack of expertise, plus a couple of very hot summers and cold winters, meant that many died. I lost the sense of the garden as it was, without having developed the garden as ‘ours’. That was why we introduced the parterre and the big bed in front of the window. Re-planting the beds is an ongoing process but I particularly love the Black Elder – the large dark red shrub. The best things in these beds have been almost free, such as the self-seeded foxgloves, aquilegia, alliums and nigella. 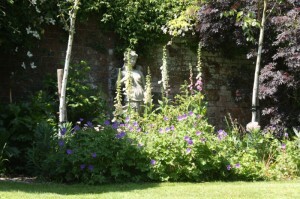 Artemis, with foxgloves, silver birch Jacquemontii and a Black Elder on the right. 6) Don’t (or perhaps do) shop after a good lunch…. To the left of the back bed is a cast concrete statue of Artemis, the huntress. Technically, she is very poor ‘quality’, but we rather love her hidden at the back of a border. I bought her about 20 years ago. I had had rather a good lunch and I passed an auction room. I left a ridiculously low bid on her, confident that I would never win it. But she really isn’t very beautiful close-up and I received a phone call to say she was mine. She looked terrible in our London garden but has found her place here. I’m delighted with the lollipop privets – they seem to make the garden feel more finished. 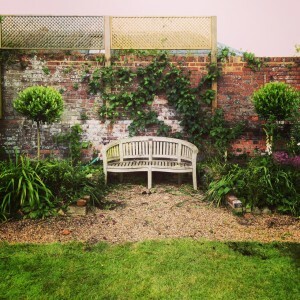 We bought the bench in a sale at the now-departed Nova factory shop in Faversham. There is a little plaque on it in memory of our cat, who died the day we left London, after 19 years with us. Much of the bedding in the back beds is self-seeded. This year’s display of foxgloves has been particularly lovely. But the latest addition is two mop-headed privets from Architectural Plants. I was given a gift voucher for my birthday from a group of friends, and I had long wanted two striking shapes on either side of the bench. We are trying to topiarise the holm oaks, but they were pushed over by the two very severe winter storms. We are not being very efficient at getting them back up again. In theory, the area around the bench will be a beautifully structured display of evergreen shapes. In practice, I suspect that self-seeding will continue. Towards the far right corner is my ‘bargain bed.’ I bought three plants: an angelica and two smyrmium perfoliatum from Great Dixter nine years ago. Both have self-seeded to colonise the entire bed. A very worthwhile £5! I’ve also found that moving plants can save quite a bit of money – more about that here. 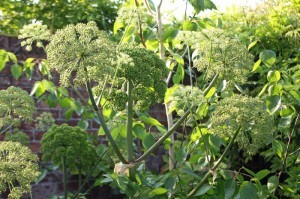 Self-seeded Angelica gigas dominates this shady bed. Photograph by Peter Garland. 9) If you don’t have time to weed, call it a ‘wildlife area’…. I think alot of us are onto this. You should now have reached the vegetable beds and the south-facing wall, complete with bindweed, bramble, nettle and some fruit trees. I wanted trees, to blur the view of the railway signalling system. 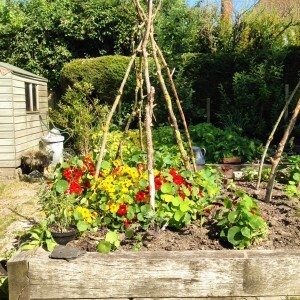 I had planted a geometric herb bed, centred around the sundial – a present from a friend. More self-seeding has made this quite wild, but I have loved the combination of parsley and fennel around the sundial. The raised vegetable beds host courgettes, potatoes, chard, kale, beans and, with any luck, sweetcorn. 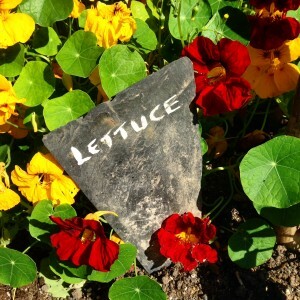 I allow nasturtium and marigold to self-seed in the paths and beds as they are good companion plants. The bean supports came from the edge of a friend’s field after the winter’s storms. The storms also left us with some broken roof tiles. A bit of spare paint turns them into great labels, which don’t fade. There are more money-saving tips from the garden here. Please don’t look too closely at the potting shed – it is very untidy and falling apart. I don’t need to water my seedlings when it rains, so I fear a new shed must be on our shopping list at some point soon. 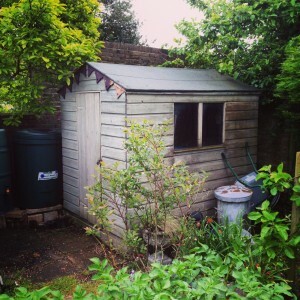 The neat, pretty shed is Mr Middle-Size’s tool shed – he is much tidier than I am. I love this tool shed – Vic Dickenson used a tin of leftover paint to paint it grey. Walk down the path from the veg beds to the terrace, and enjoy another of my favourite views. It feels as if you are walking through the big flower bed. Here, we subdivided a stipa gigantea, day lilies and iris sibirica planted by our predecessors. There is also a lovely foamy ground-cover clematis which we also inherited from them, plus a row of roses bordering the terrace. I have added dahlias (lots of them), erysimum Bowles Mauve, lavender, Echinacea, penstemon, Nepeta Six Hills Giant, irises and lychnis coronaria and gaura. I try to focus on flowers that are good for pollinating insects and birds. 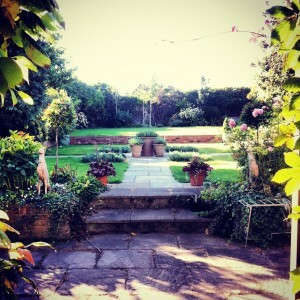 Read about how Kylie O’Brien created her glorious country garden with hardly any time or money here. 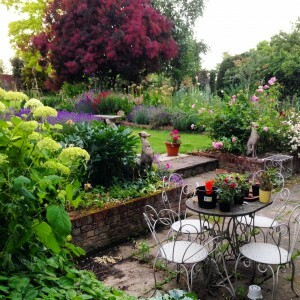 And for a real ‘no-money’ garden restoration tale, Debs Baker’s ‘Secret Garden’ strategy is enchanting and well worth reading – don’t dig that overgrown shrub up until you’ve read her story here. We’re open for the Faversham Open Gardens & Garden Market Day on 26th June, 2016, so do pop in to see how the garden has developed since last year. And there’ll be more saving of time, money and effort in the garden every Sunday morning here on the blog. To get posts straight to your inbox, sign up in the box on the top right. Thank you! 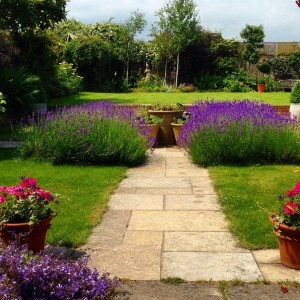 5 comments on "Save time and money in the Middle-Sized Garden…"
Self seeding is a dream! I have raised beds in the garden and before I had chance to sow any seeds this year, hundreds of poppies started shooting up, they had self sown! Was a wonderful sight of so many colours! 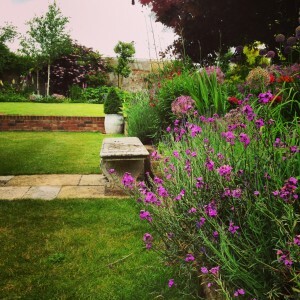 Pingback: The Middle-Sized Garden - » What do you really want to achieve in your garden this year? Thank you. The mini-polytunnel came from Harrod Horticultural http://www.harrodhorticultural.com/?Aff=G005&gclid=CjkKEQjwlcSdBRD3wva3-KOAo80BEiQAjNIhiRGlwllusNs7Z81QAlMEviJNXGV2XRv0Yqd9-7yQE2Xw_wcB – hope that link works. And thank you for coming to the Faversham Open Gardens.